Measurements: 22 cm L x 10.6 cm W2cm height by hinge. This hinge is meant for something flat, like a door. 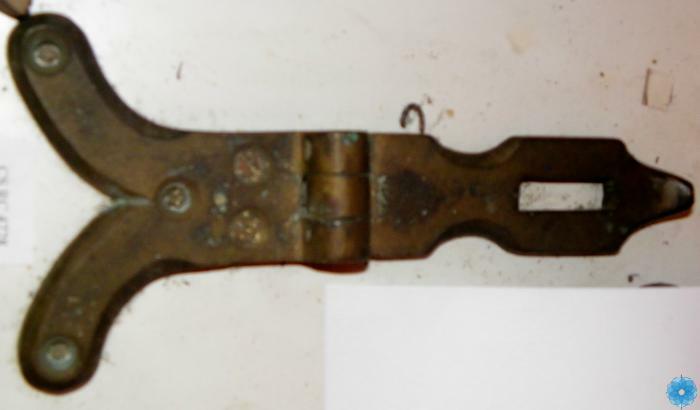 The hinge is in two parts. The one side has five holes so as to be screwed down to something. The other side is curved up on the end for easy handling, there is also a slot 3.5cm by 1cm for another piece which is missing, which would allow the item to be locked, such as a box or a door.